When it comes to the installation of hardwood floors, stair tread and risers, Mike’s Custom Flooring offers all three installation styles and have flooring contractors and technicians who are trained to advise the best option for you! 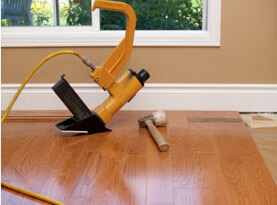 There are several things to consider when looking into a nail down flooring installation option. One of our professional hardwood floor installation technicians will look at the condition of the existing floor to be sure that it is dry, even and flat. The hardwood will be attached to the subfloor so the condition must be good to have a beautiful finished product. The flooring is installed using a cleat nail that is attached to the wood and subflooring. The finished product is a beautiful and rich look you are sure to be proud of! This is the second method that you can choose from and as the name suggests, glue is used to attach the hardwood floor to the subfloor. The considerations for this method are similar to the nail down floor. The technician will have to come out and look at the condition of the existing underfloor and as long as it is concrete or plywood, this method will work. The floor is laid after a layer of cork is set in place when necessary and then the glue is spread over the work space. Each piece of hardwood is then placed and left to dry. A weighted roller is used to ensure that each piece of wood is lying flat and securely attached to the subfloor. This method is a great option and the existing floor is taken into consideration but does not have to be perfect. The floating floor is not attached to the existing floor in any way so it is free to float where needed. The only attachment that is done is to the pieces themselves. Each piece is glued to the next one until it is a full and complete floor. This is a great installation option when you live in a place that has lots of changes in weather or is high in humidity. The wood is able to contract and expand without causing damage to the floor itself. It has room to shift slightly to accommodate any changes in the wood. 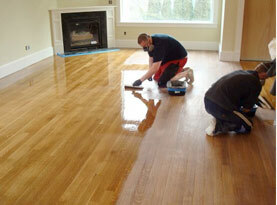 If you already have beautiful hardwood floors that have seen better days, then refinishing them can work wonders. The floors are sanded down to the bare wood and prepped to be stained with a color of your choice. They are then sealed and polished to ensure they look great. 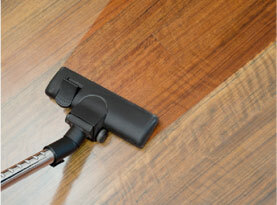 The biggest hassle about choosing to have your hardwood floors refinished is the amount of dust that will settle in every nook and cranny in your home. This is NOT the case when you hire Mike’s Custom Flooring! 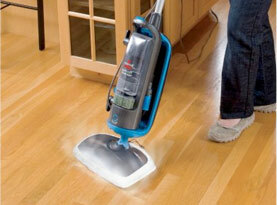 We offer a state of the art dust contamination system that makes the clean up a breeze. Our amazing system is able to catch the dust that normally would float around freely before it even has a chance to escape.